The Wireless Streaming Music Centre is like many iPod docks: it lets you plug your portable media player into it and acts as a large speaker for it. But its design sets it apart from the rest. 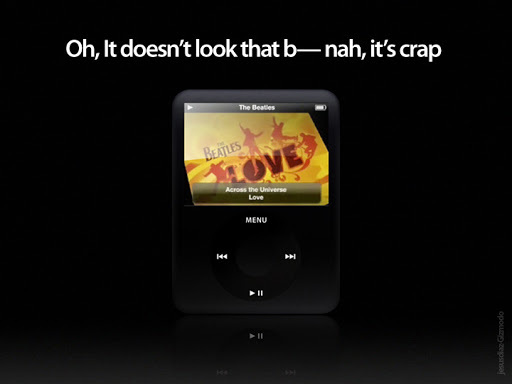 First Look at New iPod Nano Interface? We will see what happens in a few hours. Remember our first rules about rumors and leaks: never trust them, even when they seem like the real McCoy. Apple Legal has asked Gizmodo to take down the iPod nano spy shots from earlier today because they are their “intellectual property.” Out of respect for The Steve, they complied. This pretty much confirms they belong to Apple, whether they are final or a prototype. Here’s a bunch of strange and weird iPod stories. The most recent ones (pictured above) is the one about a soldier in Iraq who got shot (saved by the vest) but didn’t know about it – the iPod is how he found out that he actually got shot. Not often do we come across a piece of gear that makes us wish we’d thought of it. But when we saw this in-dash iPod dock (more of a slot, really) adapted from a car cassette deck, we dusted off the award statuette. With a Kenwood head unit, you can select the iPod as a source so song information and playlists are visible on the stereo’s LCD readout — good to have, since your iPod’s clickwheel and screen will be a little obstructed. And that Apple button is a nice touch. Tragically, the highly evolved dock is a one-shot mod of a dashboard cassette player done by CarDomain.com user JPPadula, and it’s doubtful he’s taking orders. We hope that some smart manufacturers are paying attention, but in the meantime, Alpine’s iDA-X001 can stand in as the next best thing.